William Henry Plummer was born on September 1, 1868, in Montgomery County, Maryland. He joined the Church of God and Saints of Christ on July 8, 1900. On November 10, 1900, in Philadelphia, William H. Plummer was ordained a minister by Prophet William S. Crowdy and was later sent to Jersey City, New Jersey as Overseer. On June 30, 1903, at the District Assembly held in Boston, Elder William H. Plummer was made District Evangelist by Prophet William S. Crowdy. He travel with the singers and helped to spread the name of the Church to people who were not aware of this gospel. 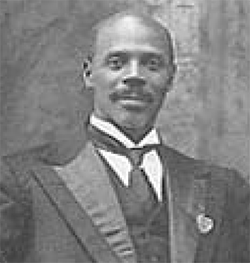 During the 1904 General Assembly, Evangelist Plummer was exalted to the high and honorable office of Grand Father Abraham, and was also appointed General Superintendent over all of the business of the Church of God and Saints of Christ. Prophet Crowdy appointed his future successors during the 1906 Passover. In the presence of the entire Congregation, Prophet Crowdy stood up three men in this order: Evangelist Joseph W. Crowdy, Chief over all the Pulpits of the Church of God and Saints of Christ, everywhere; Evangelist William H. Plummer, Grand Father Abraham over all of the Church of God and Saints of Christ, everywhere, "...and over all of my business;" and Elder Calvin S. Skinner, Counselor over all of the Church of God and Saints of Christ, everywhere. It was one year after the death of Prophet William S. Crowdy that the Chief, Evangelist Joseph W. Crowdy and Evangelist William H. Plummer, Grand Father Abraham, were consecrated to the office of Bishop by the Presbytery Board at the District Assembly held in Philadelphia, in 1909. During Bishop William H. Plummer's leadership, the Church progressed, the original farm land was reclaimed and additional acreage purchased, and he established the Belleville Industrial School and Widows and Orphans Home, and incorporated it in the State of Virginia. While attending to Church affairs in Boston, Bishop Plummer became ill. This illness marked the beginning of a gradual decline in his health. Upon his return to Belleville, he called for his son, Elder Howard. Bishop Plummer and said to his son, "I have been in the death chamber, but I had to come out because I didn't have a man ready to lead the Church." On Tuesday December 22, 1931, Bishop William H. Plummer, after being ill for 13 weeks, passed away. The funeral services for Bishop Plummer were held, December 27, 1931, at 1:00 p.m. 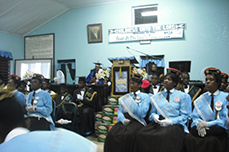 It was estimated that more than 1,000 members of the Congregation throughout the country made the pilgrimage to Belleville to attend the service, while more than 1,500 visitors were on hand. Hundreds who were unable to get inside stood outside throughout the long afternoon until the main portion of the services were over and they were allowed to file slowly to view the remains. Bishop James W. Brent of Camden, New Jersey conducted the service.